EQI would not be able to function without our wonderful volunteers! The VWIN and SMIE programs are employed to increase citizen awareness of water quality issues and encourage a sense of public responsibility and ownership for regional water resources. Nearly 100 volunteers regularly participate in the VWIN program and approximately 60 in the SMIE program. Volunteers are trained in monitoring by EQI or partner organizations and receive one-on-one education about threats to water quality, pollution control, and the significant role citizens play in the preservation process. VWIN volunteers collect stream and lake water samples at specific sites once per month. They drop the samples off at a designated gas station for cold storage until the coordinator brings them to the EQI lab for chemical analysis. We currently have volunteers for all 54 Buncombe County sites. If you would like to be put on a waiting list to volunteer, please contact our Stream Monitoring Coordinator at staff@eqilab.org. If you live outside of Buncombe County, let us know and we can put you in touch with VWIN coordinators near you. SMIE volunteers begin by attending a seasonal training workshop. Each spring and fall, EQI offers a six-hour training, which includes classroom instruction on general stream ecology and benthic macroinvertebrate (stream-dwelling bug) identification, as well as in-stream demonstrations of sampling techniques. Trained volunteers then sign up for the sites they would like to sample that season. Each site is then sampled for invertebrates each spring and fall by a small group of volunteers, accompanied by Group Leaders who have undergone extra training. 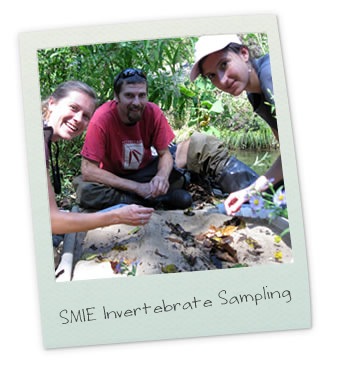 Please contact staff@eqilab.org if you would like to receive an email notification of the next SMIE training.